Spirit of the Jerseys State History Fair - May 14, 2016 ~ The History Girl! The Spirit of the Jerseys Returns to Monmouth Battlefield! 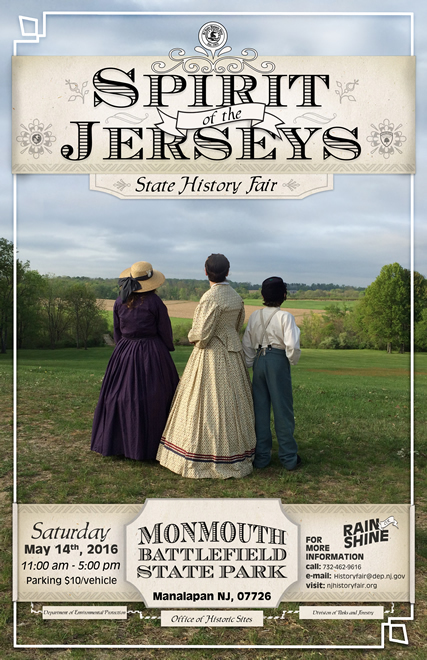 Experience five centuries of New Jersey’s history all in one place at the annual Spirit of the Jerseys State History Fair - a historical festival for all ages on Saturday, May 14, 2016 at Monmouth Battlefield State Park in Manalapan, New Jersey. This year’s SPIRIT of the JERSEYS State History Fair will be held on Saturday, May 14 at Monmouth Battlefield State Park from 11:00 am - 5:00 pm, rain or shine. Five centuries of New Jersey’s history will be represented by exhibitors from all 21 New Jersey counties, Maryland, New York, and Pennsylvania. Highlights of the day’s programs will include an exhibit that features a replica of President Lincoln’s casket with the 14th NJ Volunteers serving as an Honor Guard. A series of historical presentations on such Civil War era topics as music, literature, and soldiers’ personal accounts of their service, will be presented in support of the exhibit. Kenneth Serfass, who will portray General Ulysses S. Grant, will talk about his relationship with the late President. Many other favorite activities will return including 19th c baseball, plowing demonstrations, Lenape foodways, antique cars and historical figures from NJ’s past. One of the largest battles of the American Revolution took place in the fields and forests that now make up Monmouth Battlefield State Park. The park preserves a splendid rural 18th-century landscape of hilly farmland and hedgerows that encompasses miles of hiking and horseback riding trails, picnic areas, a restored Revolutionary War farmhouse and a new Visitor Center that opened to the public on Flag Day 2013. The park is easily accessible from Routes 9 and 33 and is located at 16 State Route 33, Manalapan, New Jersey 07726. For more information and a complete list of activities about the Fair, visit www.njhistoryfair.org or call 732-462-9616. The Fair is sponsored by the New Jersey Department of Environmental Protection’s Office of Historic Sites, Division of Parks and Forestry, and its partners.